CAT Eyes security consulting services are delivered to your company by retired military and law enforcement professionals. We have been contracted to do work with the US Border Patrol, National Aeronautics and Space Administration (NASA), Trailways Bus, Coach USA, Academy Bus and others. We are proud members of the International Counter-Terrorism Officers Association (ICTOA), Veterans of Foreign Wars (VFW), and the American Legion. Our President serves as the Chairperson of the Security Committee for the American Bus Association, member of the DHS Infrastructure Protection’s Information Sharing working group and is active in numerous Homeland Security Exercises and Initiatives. CAT Eyes has written and administered over $4 million dollars in Homeland Security grants for our customers. Click on each of the links below for more information. CAT Eyes will develop an entire Multi-year or Single Exercise plan tailored for your company. 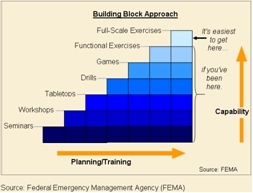 The CAT Eyes Exercise Development Team has planned and executed the entire scope from drills to full scale (see diagram below). They can also represent your company at exercise planning conferences to ensure that it will meet your corporate goals in participating in a government run exercise. For more information contact us. CAT Eyes has written and administered over $4 million dollars in grants. In addition to writing the grants we handle all the administration. If you believe you are eligible for a particular grant then contact us. We will review the grant you think you are eligible for and then interview you. If we feel you are eligible and have a significant probability of obtaining the grant we will write it for no upfront costs. Based on a solid track record of performance, CAT Eyes works on a contingency basis, we only get paid if you get grant funds. If you do not receive grant funding, we do not receive payment. For more information contact us.